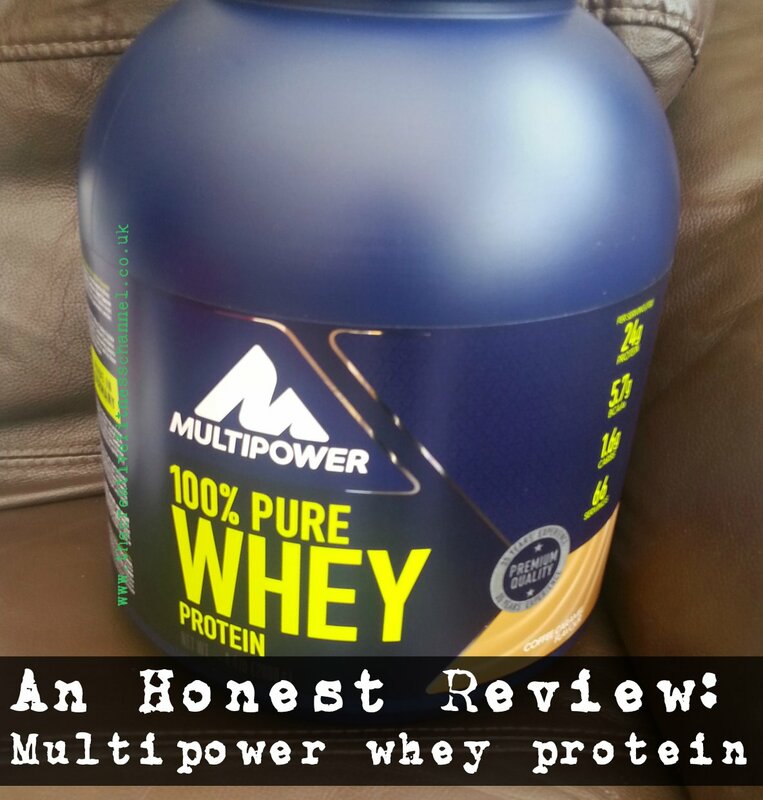 Home » Creative » Daily Diary (Personal Posts) » An Honest Review: Multipower Protein, All flavours! 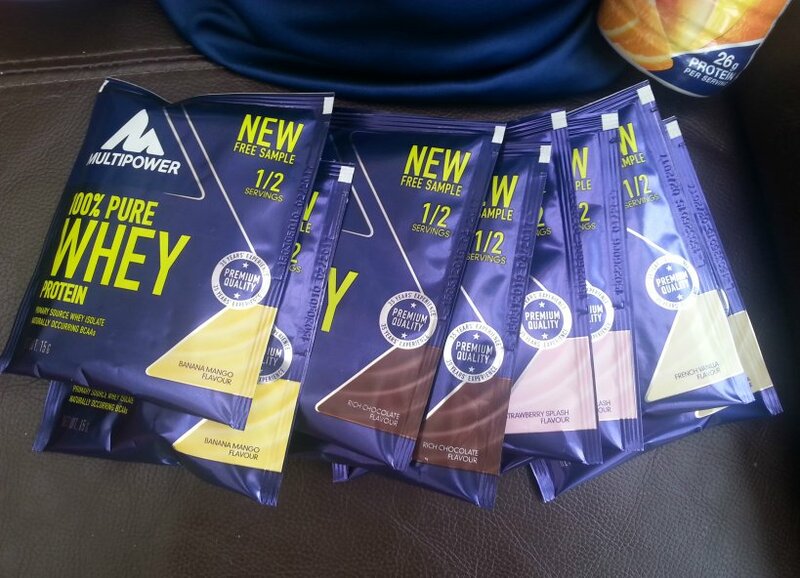 An Honest Review: Multipower Protein, All flavours! 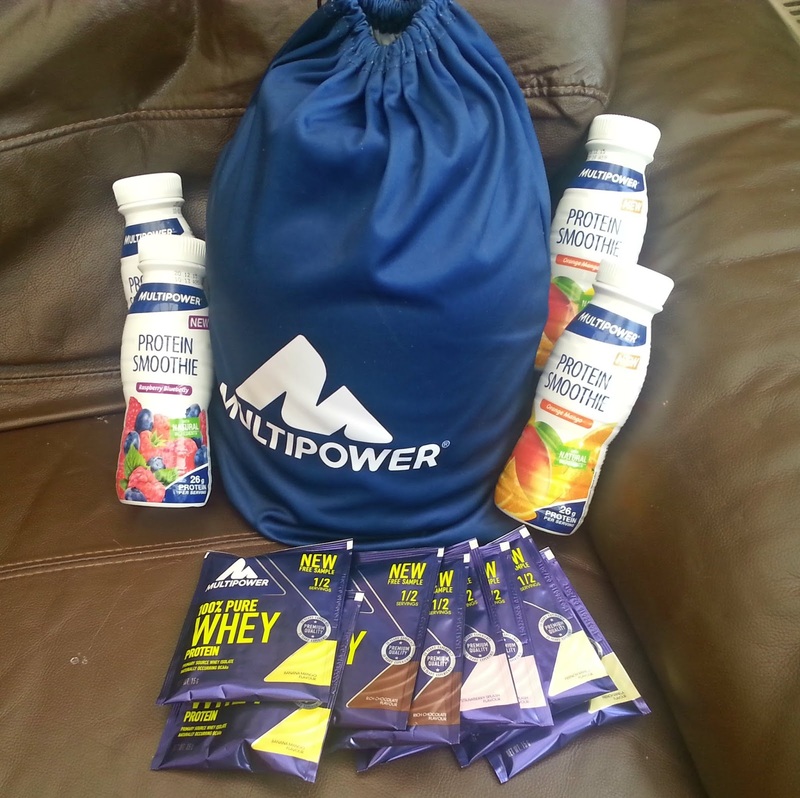 In early July I was contacted by the Multipower company, asking if I’d like to do a review, I jumped at the chance..mostly because I love a good freebie (who doesn’t?) but also because my powder supply was running a bit low, that being said I was more than pleased with the supply they gave me. One week after contact the product arrived, in a massive box, I almost told the courier it couldn’t be it, it was too big to be my parcel! I was expecting a few hundred grams of powder to test out, they gave me 2KG..and tonnes of other seductive goodies..I’ll go through them a little later. Once initial guilty happiness had subsided I put my official ‘review’ head on, I won’t let people buy my positive reviews with goodies (as much as it helps) I like to be completely honest with the company and have no qualms with telling them straight if I don’t like something, yep, I’ve done it before with fabletics and with another powder coming up for review in a few weeks..
That being said, the 2KG powder (£36.99 as a normal price) was coffee and toffee flavour, not what I would expect of a protein powder, I’ve seen them before but it’s nothing I’d have bought personally. However, I was pleasantly surprised, the powder mixed in easily and was smooth and creamy tasting (much like the other flavours I found out). The coffee flavour was mild and the toffee was more prominent which made the flavour much more tolerable than initially expected, still too sweet for my liking but as far as having this as a shake every day I’m happy to keep drinking it! Perhaps even buy it again when it runs out,(I did!) it’s definitely dessert like in flavour. In terms of nutrition it’s definitely not the ‘healthiest’ flavoured whey as it comes with added sugar (No sh..shoes sherlock) so of course that means they’ll be ‘less’ good for you, they’re still amazing though. Now, onto the goodies..Firstly there are two different shakes, one ‘raspberry blueberry’ and one ‘orange and mango’ I got two of each.. you can guess which one I offered out to my brother.. Orange and mango, “Go on, it’s orange and mango it’s going to be my least favourite, take it..you’ll be doing me a favour” Boy was I wrong. I was so sure it’d taste nasty I didn’t even pap it by itself..
Banana and Mango is so fresh and sweet and perfect as a ‘smoothie’ you wouldn’t at all guess it was a protein shake, I wish I’d saved both bottles and OH yes, you can bet on it that I’ll be buying more of these in future. The raspberry blueberry..not so much. It was like a watery yoghurt that dried the mouth out, raspberry flavour was nowhere to be found it was just strong fake blueberry taste, not happy with that flavour, but then again I’m not a yoghurt lover really. Worst first, get them out of the way, I’m not saying this one is anything less that good..but it’s like they’ve put a lightweight in with the heavy weight champions, only slightly banana and a hint of mango (not that that’s bad..) just not ‘knock my socks off bend me over’ good. Not to be confused with a tall dark and handsome gentlemen..but just as satisfying, this one stays with the creamy-smooth theme and pulls it off very well, just enough chocolate to pass off as sweet but still feels healthy. This one is again that fake strawberry taste but it’s creamy and really gets away with the fake taste, do you remember those puddings that you add milk to and whisk and they get thick? It’s like that flavour, very tasty! I saved this one specifically till last, if you’ve read this far down the article then you deserve to be rewarded. They, make by far, the Best Protein Shakes I have ever tasted, reviewed.. had the pleasure of digesting! No, seriously. It’s like the Beyonce’ of protein shakes, smooth sweet (but not over powering) and just beautiful. 6 months on and I’m still drinking the coffee and banana shakes but oh how do I long to get some french vanilla..
Go out and get a sample or tester or steal some* if you don’t believe me. The flavours are all amazing, erm..did I mention french vanilla? They blend effortlessly. 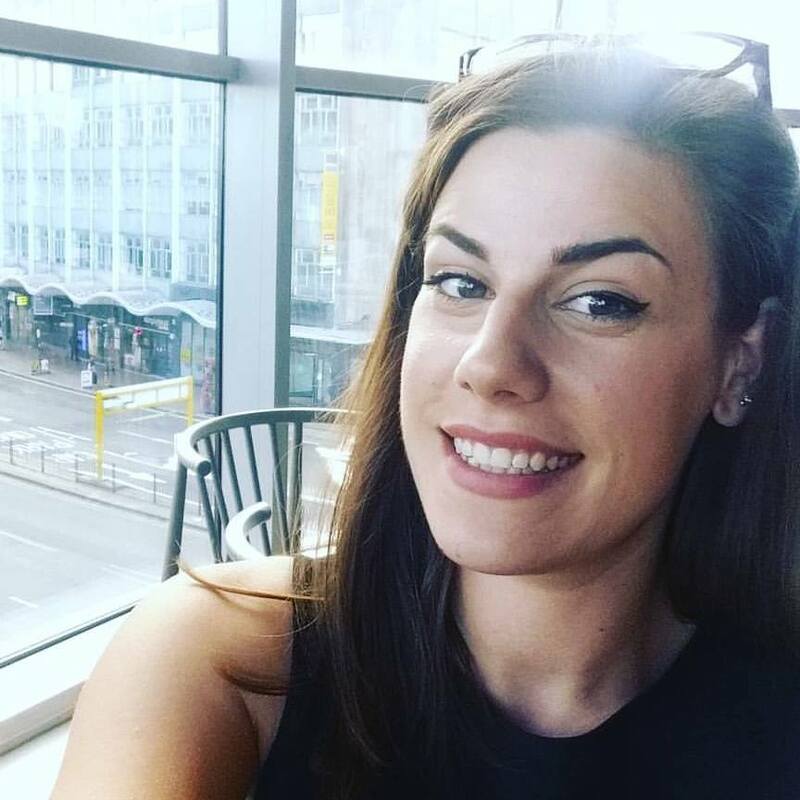 All in all, I’m really happy with the company, the products and the correspondence between us. They’ve been a delight to work with. The protein they have in their product is slightly higher to those on the market which leads me to believe that’s the reason I didn’t get sent any ‘unflavoured’ but in all honesty? There’s no more added sugar than in any other protein shakes, they taste amazing and they’re a great price (I’ve looked it up). They come in various sizes but it still seems a little irrelevant, unless you’re training as an athlete or a fitness model there’s no reason for needing to gain in a hurry. I’d probably only spend my money on these in small portions when I just need a hit of good flavours. After I emailed the lovely PR person back, to explain how lovely the flavours were I asked for a discount code. They graciously replied and gave me that.. and one to share with you!! Oh and also, I got a bag too. Ha! Just a quick plug for my other platform, I had a video out today creative Dark Chocolate and Cranberry crunch cakes, have a look! *I’ve written a new recipe for this too! ** The product was gifted as a review item not as payment:) Affliliate links in laid with some special offers too! « Mix up your routeen: A selection of workouts & youtube channels you must have on your list!